But the photo above is so much more than lovely heels. It is summer in Copenhagen. A smashing red dress flowing down the street on a tailwind. Warm weather, stylish cyclists, a whole world of optimism. In Copenhagen getting stuck behind other vehicles in traffic is not always a bad thing. Another energetic shot of a Copenhagen cyclist in action. Heels again. Let's not forget the fashionistos of the city. I really enjoy to see woman with such style in København, much better than any fashion magazine, even if I'm not a "fashion girl"!!! 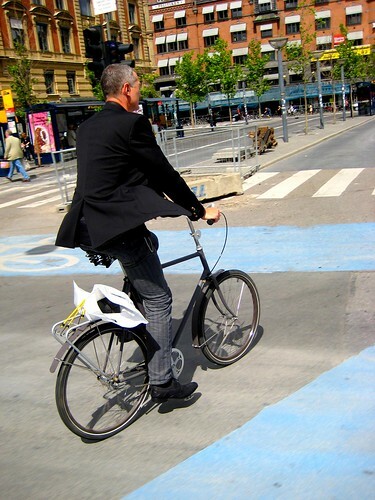 I really enjoy to see real fashion men on their bike's too, he looks more professionnal on two wheels than in any box with four wheels... well, that's just my opinion!!! I live in the US midwest and ride in sandals and heels all the time. People think I'm insane of course but I just smile and keep riding. Why ruin my pretty dress and bike with trainers? Yuck! I no longer wear really high heels (I'm a boomer) but certainly mid-heels (such as the red shoes at your blog title). That is simply a matter of cycling and jumping off on the ball of your foot, which I would do in any footwear. Do you also do features on other famous cycling cities? Not just Amsterdam, but also Ferrara, Strasbourg, and nowadays, even Paris! Paris is a lovely development, though while I approve of the Vèl'lib initiative, I don't think it can be a subsitute for a fuller cycling culture in which most people own their own bicycles. I remember the beginnings of the Paris cycling renaissance, during a protracted transport strike - in 1995? Certainly saw a lot of chic fashionistes/cyclistes of both sexes including one memorable yellow summer dress. I live in the US and wear heels on my bike all the time (and am asked about it a lot). Riding the bike in heels is much easier than walking far in them. tracy, we speak the same language! lovely to hear! lagatta: we post many guest photos from other great cycling cities. the link to guest photos is on the right. we did a feature week of paris bike culture starting here. velib IS spawning bike culture. bike sales in paris are up and there are MANY normal bikes on the streets. check out the posts. No wonder Denmark is supposedly the happiest country on earth. Love that top image! Gorgeous dress... I have to say explaining the 'heels thing' is starting to get really old. In fact its usually men not women who often have something to say. It really gets my goat because I don't approach some stranger and make off-handed comments on their ensemble.